The 2019 London Townhouse event has officially kicked off, and we can now talk about all the new novelties for 2019. First up, let's dive into the brand new Armed Forces Collection! 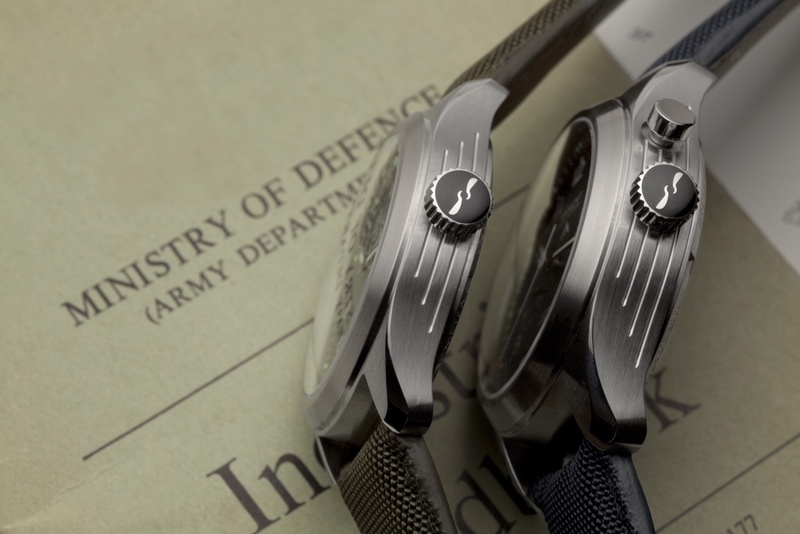 Some of you may have heard whispers in late 2018 that Bremont had reached an agreement to officially parter with the British Ministry of Defense. 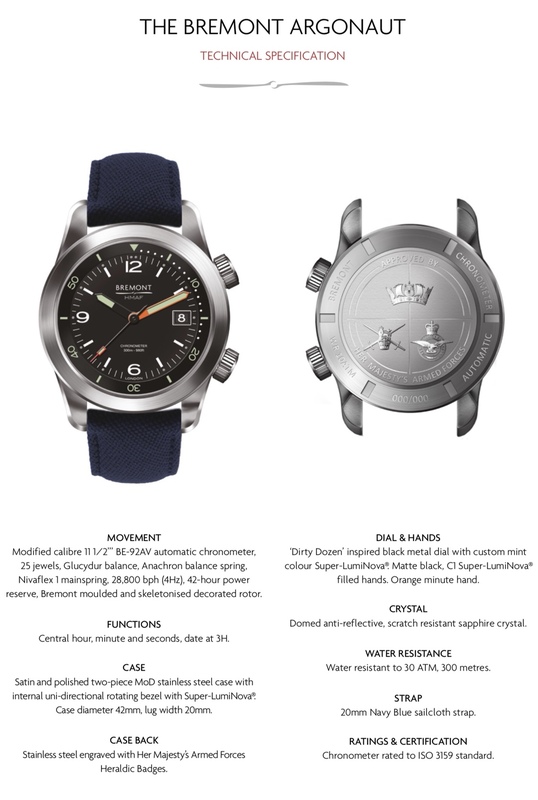 This new collection is the fruit of that partnership, and Bremont have designed three new watches to represent each branch of Her Magesty's Armed Forces; the British Army, Royal Air Force, and Royal Navy. 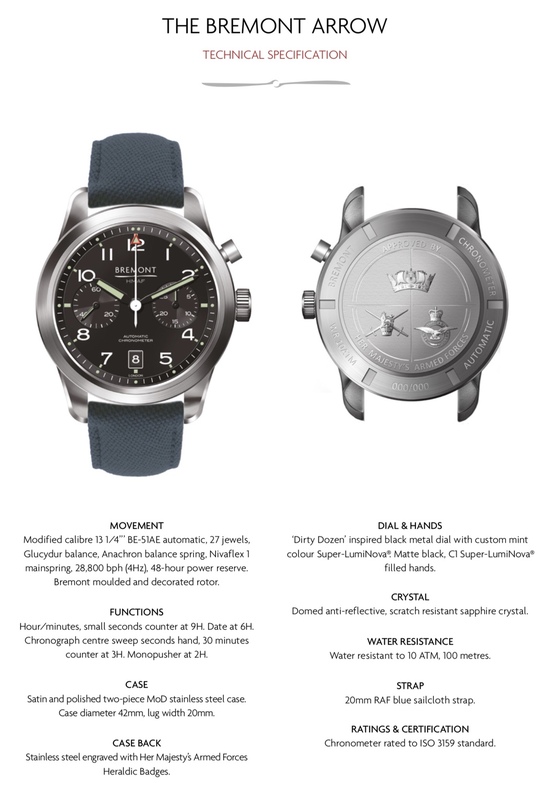 From the press release, Bremont are in an absolutely unique position here as "the sole luxury watch producer allowed to legitimately use the signs, symbols and Heraldic Badges of all three services." 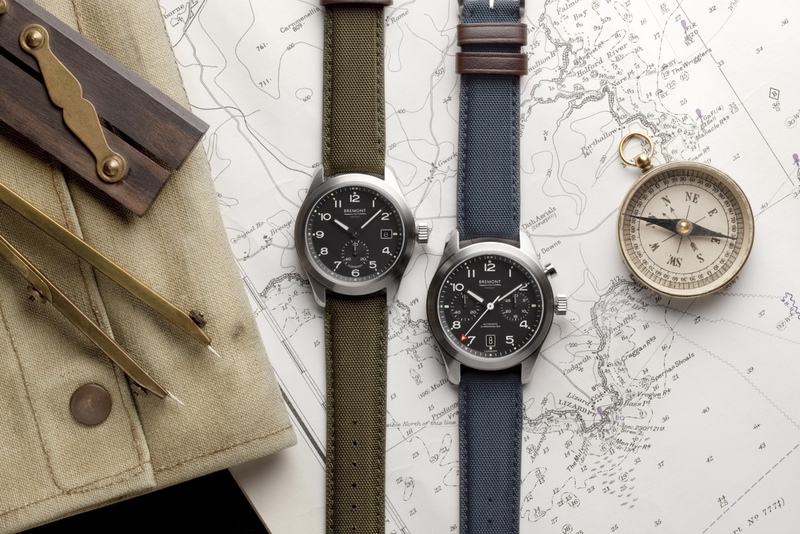 These three models are very much part of the Bremont Military lineup, and will be made into various unique squadron versions, but these three particular models are intended for civilian clientele. Bremont states that these three models are very much inspired by the "Dirty Dozen" watches that were built for British soldiers during WW2. To better replicate the legacy of those watches, Bremont have moved away from their patented Trip-Tick case, and for the first time are using a new two-piece case with screw-in, stamped case back. 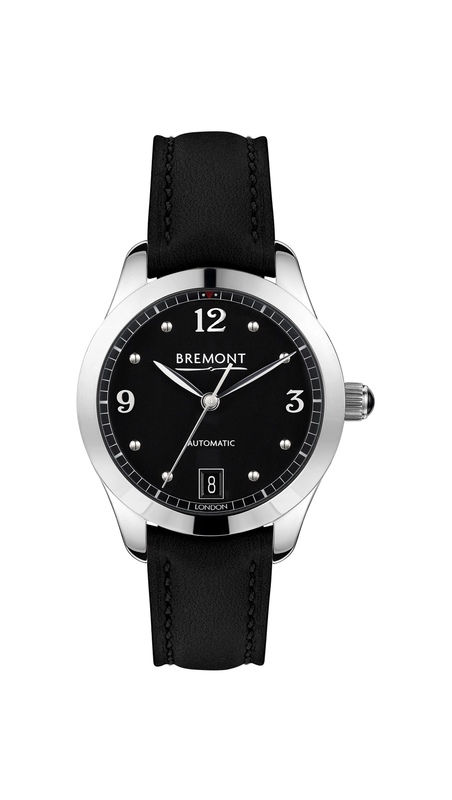 The Bremont Broadsword is the watch that represents the British Army. It uses a 40mm two-piece case and is in a traditional three-handed form factor with a sub-seconds dial at 6H. 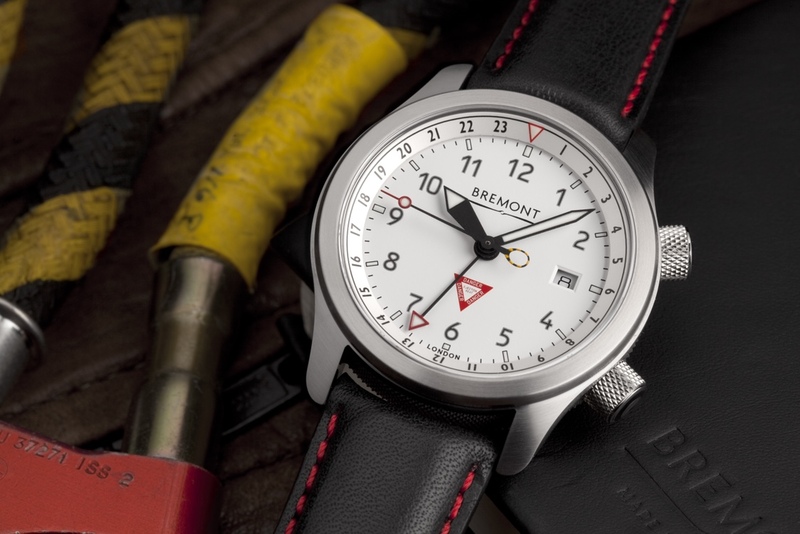 The Bremont Arrow is a 42mm mono-pusher chronograph that represents the Royal Air Force. The mono-pusher serves to start, stop, and reset the chronograph function all in one mechanism. The 9H register is a running seconds, and 3H register is elapsed minutes, much like you would find on an ALT1-C. 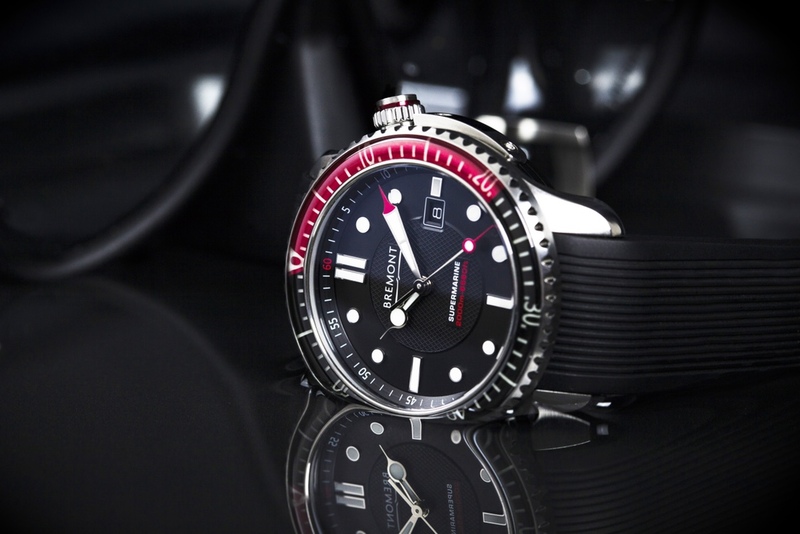 The Bremont Argonaut is a 42mm dive watch with a stunning set of hands and the same twin crown functionality that the MB/U2 watches utilize. 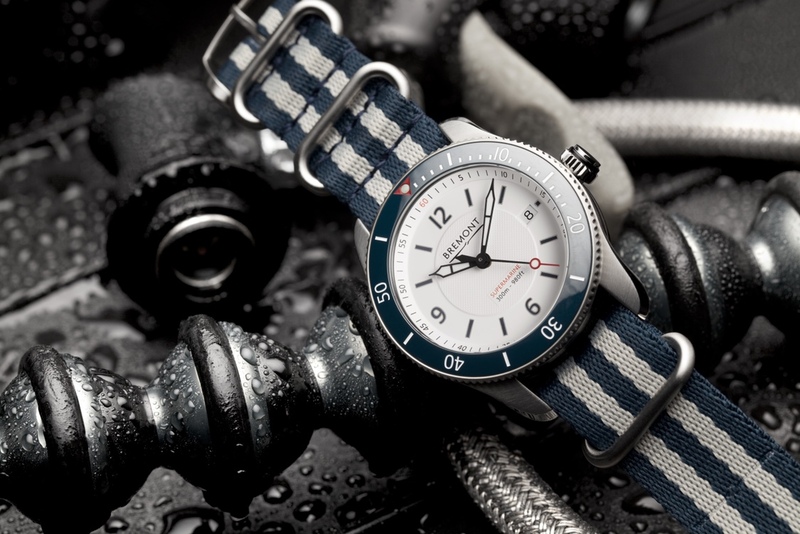 This watch represents the Royal Navy, with underwater legibility being the primary design concern. Hence, we get the large, orange minute hand filled with lovely green lume! 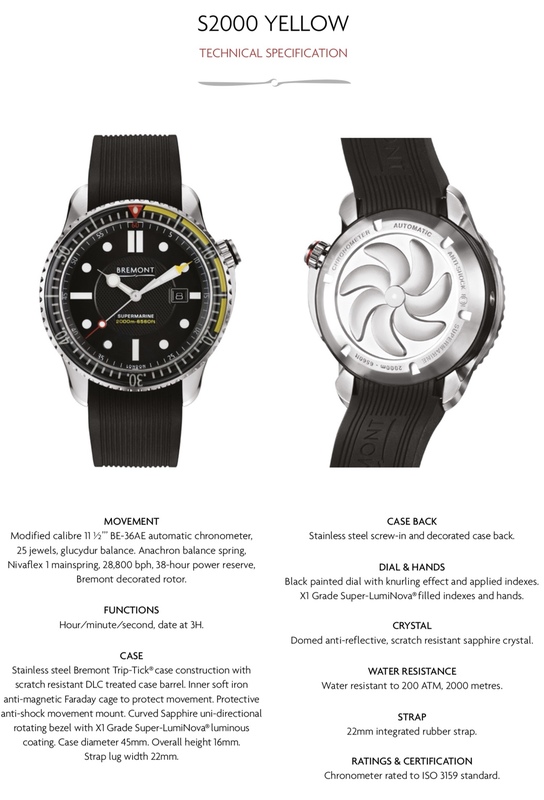 This watch is has a water resistance rating of 300m, whereas the other two watches are rated to 100m. Speaking of lume, here is a lume shot of both the Broadsword and Arrow, along with some other lifestyles photos. Unfortunately, I don’t have any other photos of the Argonaut at this time. 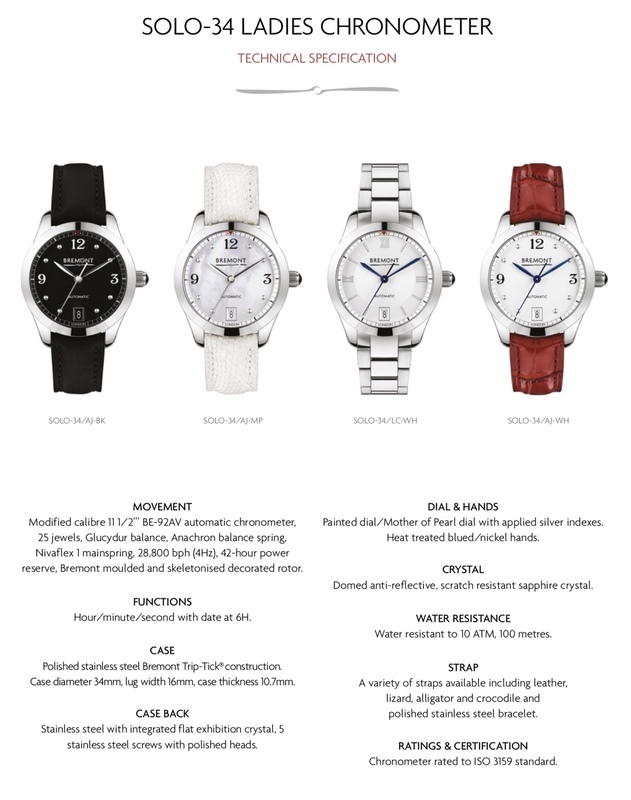 These 3 Armed Forces watches all feature 20mm sailcloth straps with satin 18mm pin buckles. Will update with prices and availability when I have that information. 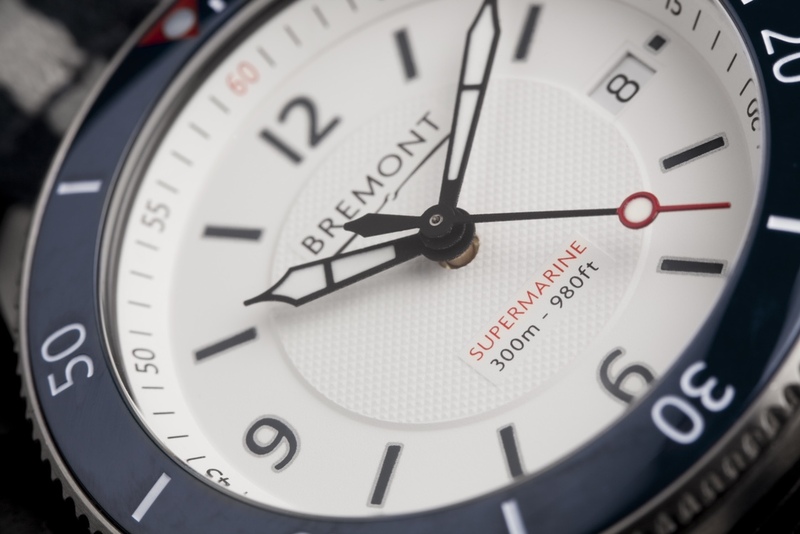 Next up, Bremont continue to refresh their Supermarine Collection by giving us 2 new models: an S2000 makeover and an S300 White. As the lone 45mm watch in the Bremont collection, the S2000 made its debut in 2013 and has been the most capable diver in the Supermarine range, being tested beyond 2000m depth! Despite its robust origins, the design was overdue for a refresh. The new S2000 models will come in two color options: Red and Yellow. The watch remains 45mm in case diameter, omits a day window, but retains a date function. 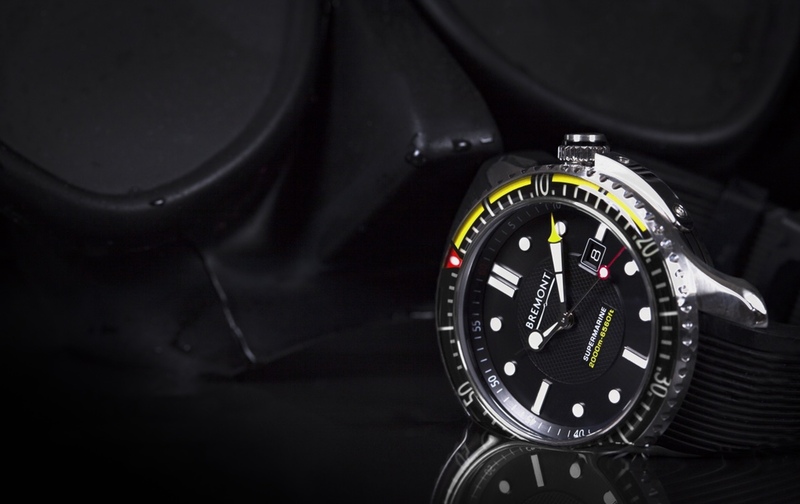 While many of the other Supermarine watches now feature a ceramic bezel, the S2000 retains a sapphire uni-directional dive bezel with color accents from 0 to 20 minutes. The classic rubber Supermarine integrated strap has been kept as well. The center of the dial now features the subtle knurling pattern seen on the S501 and Waterman watches, and adds a level of texture and detail that the refreshed S500 models lost last year with their refresh. Both the yellow and red versions are quite vibrant, which some will love, but will certainly not appeal to everyone. 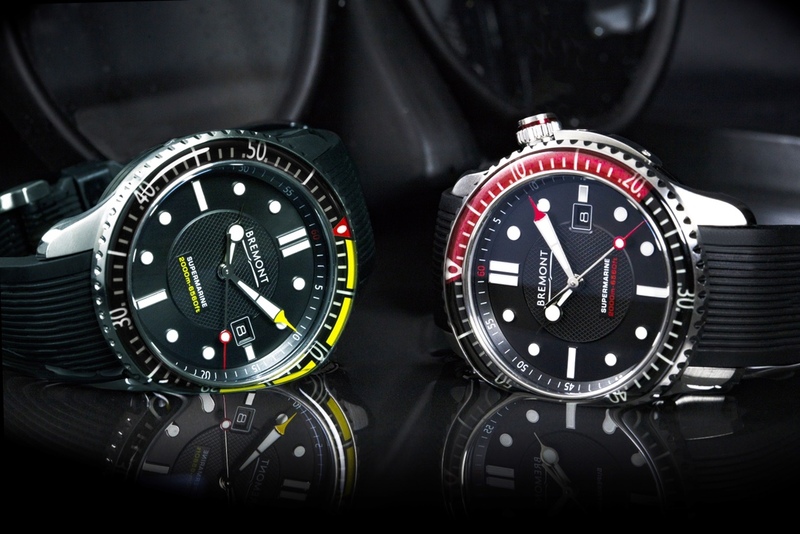 I personally think Bremont did a nice job of not overusing the color splashes on both of these models. Edgy, but certainly not gaudy. With all of that lume real estate, I’m anxious to see how well these watches light up under a UV light! 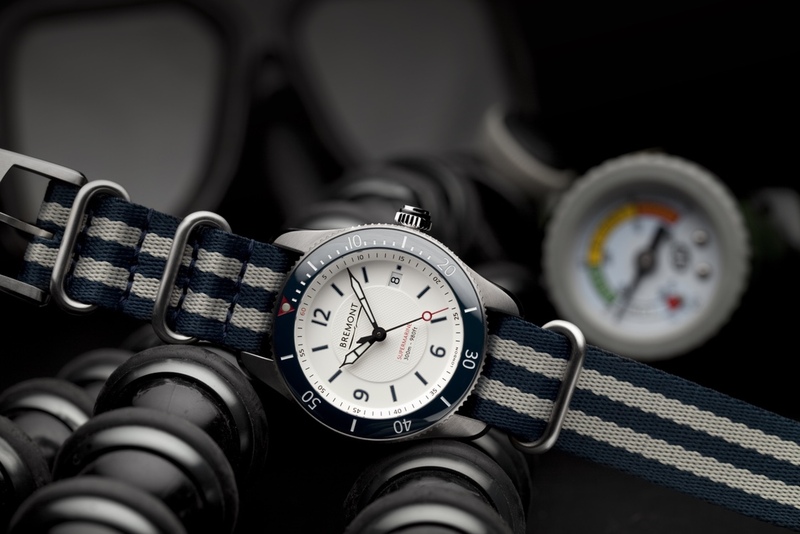 The S300 White is certainly quite reminiscent of the beautiful 2018 Waterman S500 watch, but in the popular 40mm form factor of the S300 case that Bremont debuted two years ago at the 2017 Townhouse. Obviously, this is a white dialed watch with navy blue and silver accents. Bremont have used a polished ceramic bezel here which looks fantastic! The center portion of the dial is knurled, just like the S2000 above, adding depth and interest. 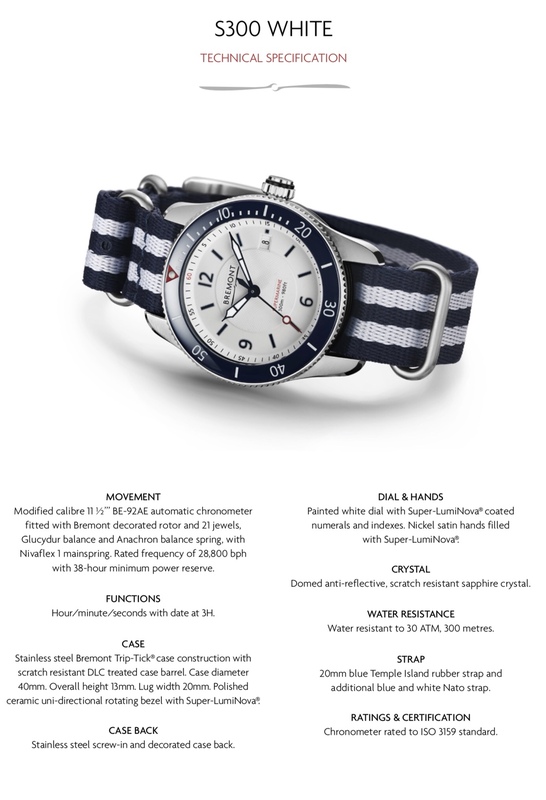 The S300 White will come with a navy blue Temple Island strap and a navy blue and silver NATO, seen in these photos. While the MBII has had a white dial option for several years now, this is the first time we've seen the color scheme on the GMT handed MBIII. 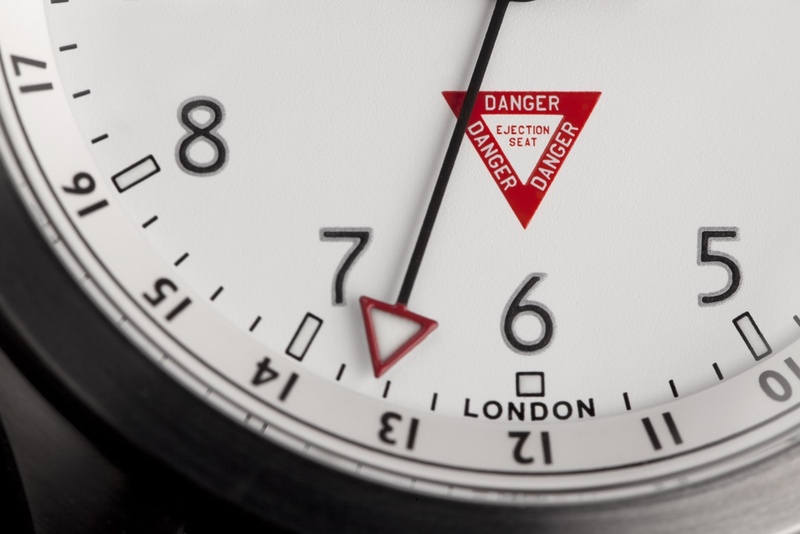 The dial adds the classic "Danger Ejection Seat" triangle in red, and features a titanium colored center barrel. 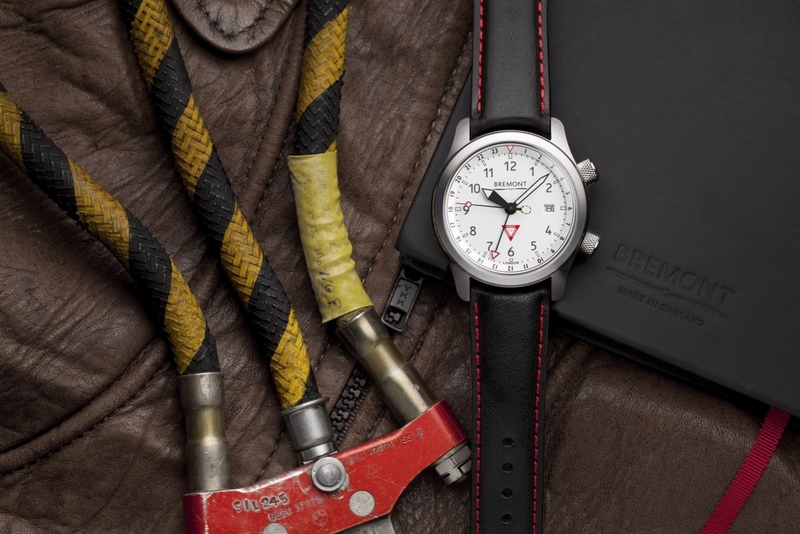 Of course, the classic MBII second hand remains, and a unique etching of an F-35 ejection seat, called the MK16 seat, is prominently displayed on the caseback. The MBIII 10th Anniversary Edition will come mounted on a black calf strap with red stitching. 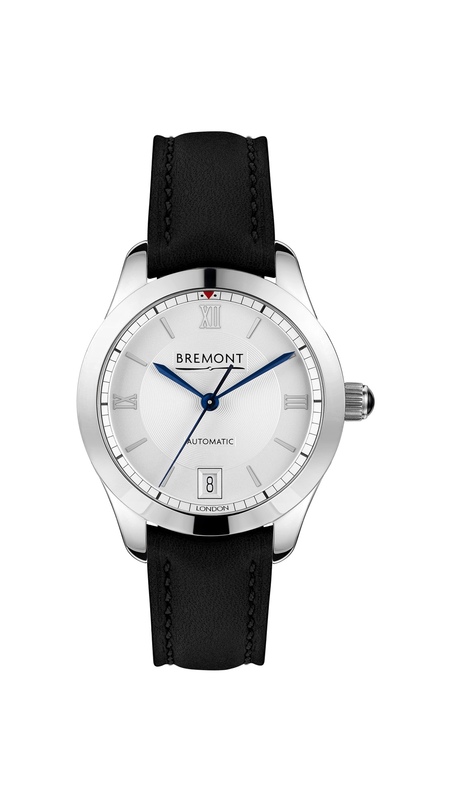 Finally, the Bremont ladies range receives a refresh in a slightly larger form factor as the SOLO 34 collection. The previous SOLO 32 models will be retired in favor of these new and improved models. A Mother of Pearl dial now exists in the Amy Johnson/AJ model, and the popular Lettie Curtis/LC model receives some elegant applied roman numerals. These models are all currently staginess steel, but based on the rose gold models previously seen in the 32mm iteration, I wouldn't be surprised to see Bremont add a gold option to the 34mm SOLO range in the future! Thats a wrap for the 2019 Townhouse collection! What you think of the new pieces? Please comment below what you liked and anything you didn't. Feel free to pass along any inquiries, and I'll be sure to get an answer for you! Last edited by jwalker9; 02-26-2019 at 08:33 AM. Some interesting pieces from Bremont this year! My pick of the bunch would be the new Waterman-esque S300, I think that colour combination really, really, works well - and especially when paired up with that NATO. As for the ‘big’ news - the new Armed Forces Collection, that is an interesting move. The watches themselves will no doubt appeal to those who have served, but aside from that? I’ll be intrigued to handle them in the flesh and see how the new case feels and looks, they certainly give a ‘solid’ impression! That white s300 is real nice and I'd have one of those any day! The Armed forces watches look off. I they look very un-Bremont to me. The cases look a bit naff to be honest and go against one of Bremonts greatest strengths. All the lug sizes are 20mm regardless of size of the watch so unless they make the straps in 22mm (which I doubt) no luck in getting some nice new straps. I was hoping they would give the solo range some love and maybe work on a new bracelet. Never mind, there's always next year. I have been crying out for a white MBIII but I don't want it to have a titanium colored center barrel :-( Want it in blue please! Nothing there has made me regret my recent Alt1-c pw purchase. I quite like the HM Forces watch, however HMAF is not an abbreviation I am used to seeing, so for me having that on the dial just looks odd. As for the 2000, I would have thought they might have gone Titanium, as many seem to think the original was a little heavy. I'm really torn on these MOD watches. Il have to see one in the flesh as they look pretty cheap with that case. I think they would have looked better with a classic case or a raw steel barrel, or just machine them to be one piece but have a more of a classic Bremont case shape. I kind of feel like these are being produced to make the military special projects more profitable. At the moment mil special projects are the proper Bremonts with a unique dial or hands sold for half price ( DLC MB3 with unique dial and display back cost my father Â£1800!). There's only so many watches they can sell for that cheap before it starts to make poor business sense. These new MOD watches are now the cheapest watches they make, cheaper than a solo or Airco. 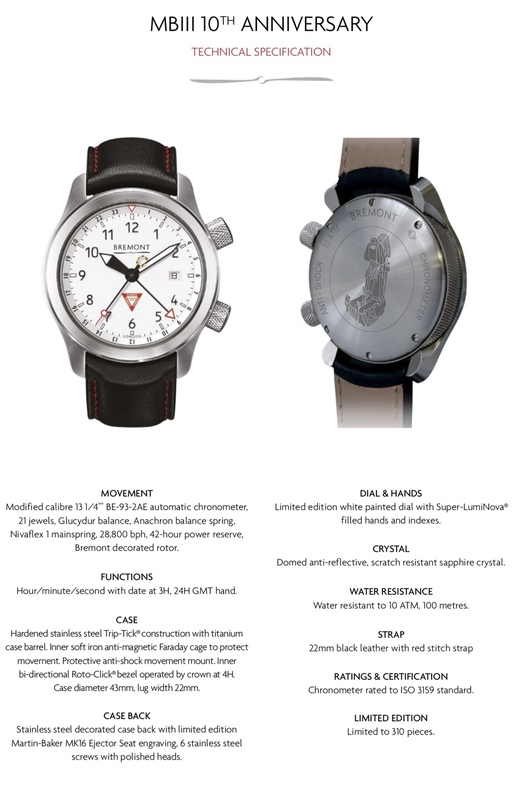 I think going forward these will be used for all military special projects under the guise that they are the official MOD watches for all special projects and the standard range no longer being offered for discounted military special projects (if the normal range is used it will come at a premium). 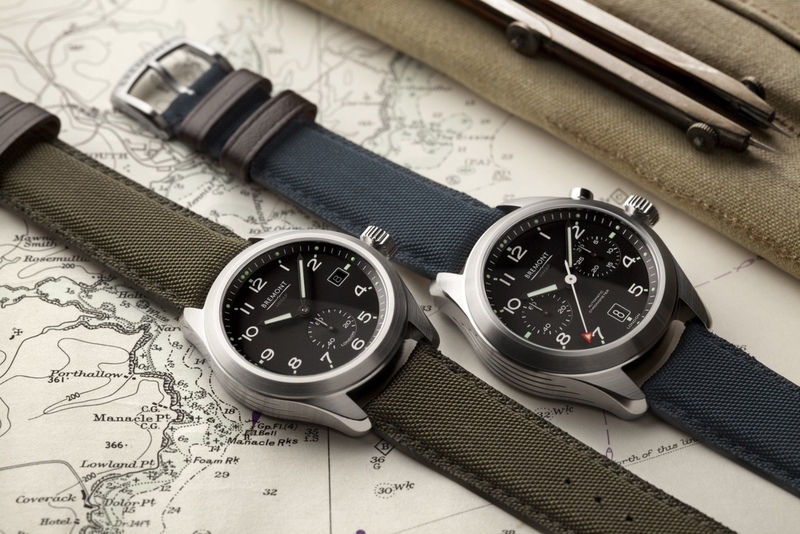 I've always thought that the discounted military special projects was fantastic marketing to make Bremont look like the top brand for pilots / forces but it was unsustainable to offer the watches at such a discount. 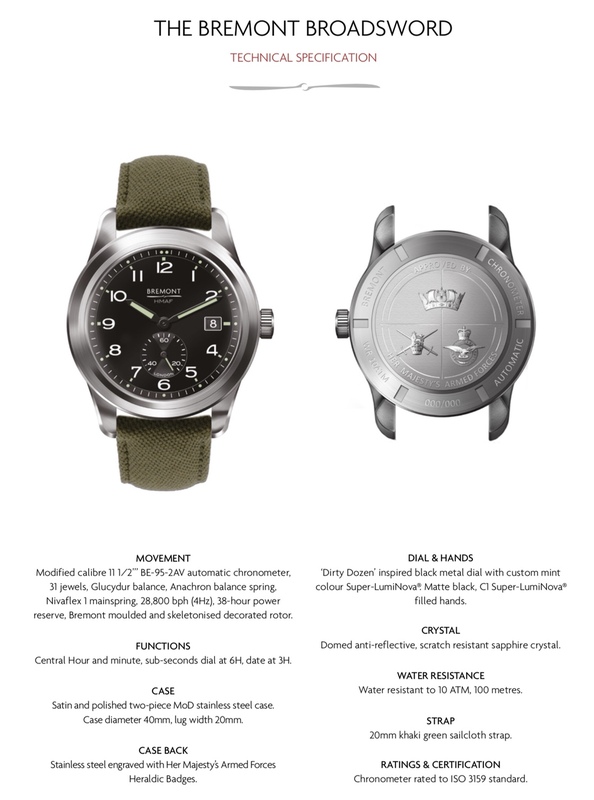 This looks like a sustainable way to keep the military watches going without sacrificing to much profit. The cases look a lot easer to machine and put together allowing the watches to be sold cheaper. Id suspect the movement also isn't decorated (besides the rotor). 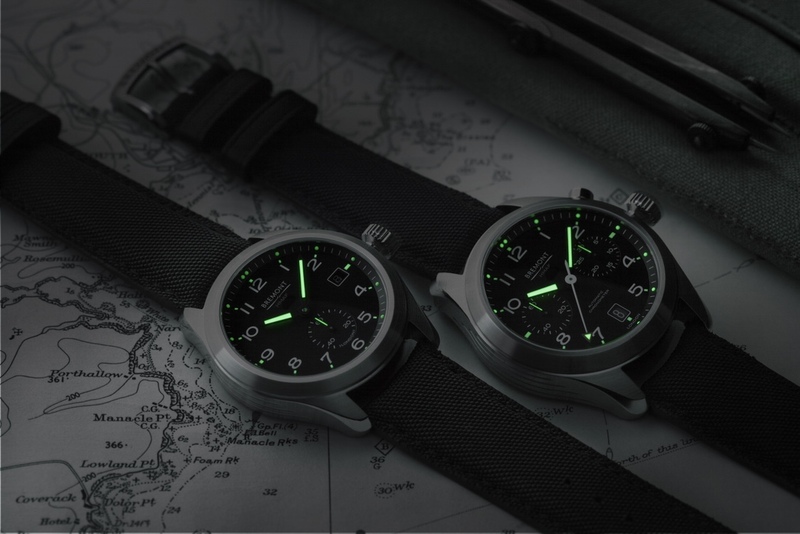 These look like Bremonts new budget watch. Anyway that's just my two cents. Id love to hear everyone else's thoughts. Last edited by Ryan; 02-26-2019 at 09:09 PM. I’m a bit torn with all the new watches. Nothing really stood out as exceptional. The MBIII 10th anniv is nice with the leather strap but I agree that the titanium barrel seems a bit standard. With the steel bracelet it felt too heavy. With it being ltd it might have been nice to do a full titanium version. 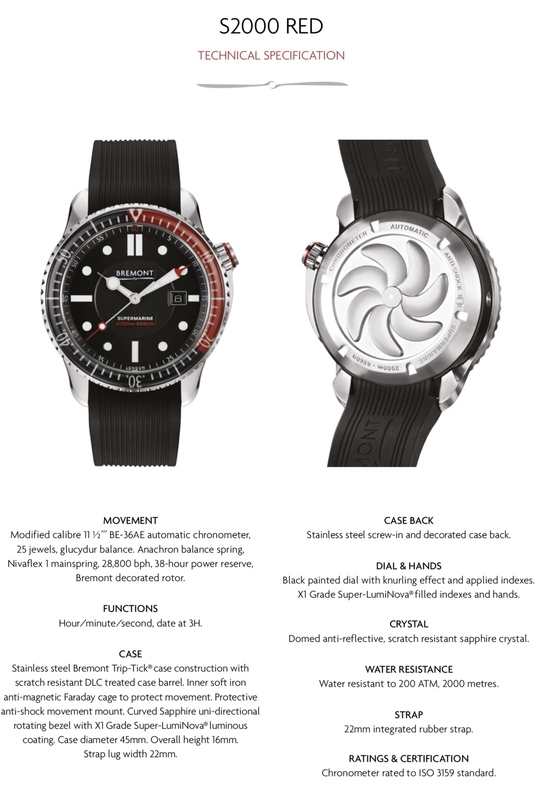 The new S2000’s I like and the S300 was nice as well but I was slightly concerned that it would have an impact on the ltd edition status of the Waterman, a very similar looking watch but not limited. The armed forces watches will take more thinking about. I thought the case was nice but what I found odd was the variation in type and size. I would have liked to have seen similar watches with different colourings. As it stands it gives the impression of the RAF being the best, then the Army, then Navy. The Solo 34’s are nice but just a revamp of the 32’s. 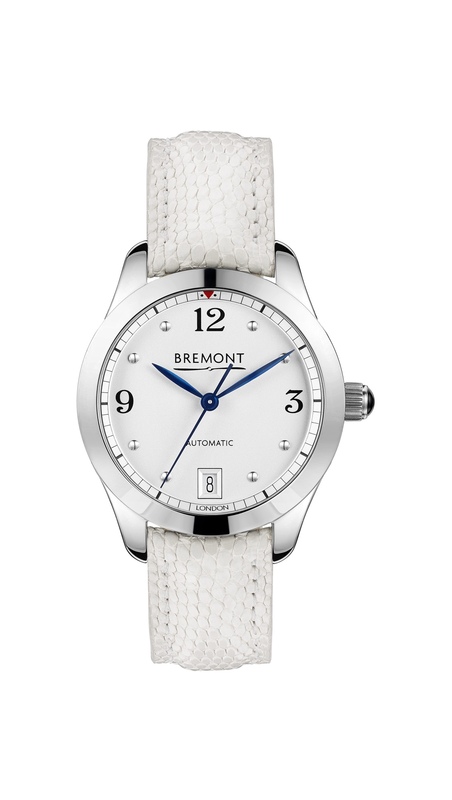 Might be nice to see something a bit more inventive from Bremont for the ladies. The ones that caught my eyes are the S300 (white) and limited edition MBIII. Was hoping for a different ladies range though. Love to see them in person one day!